Drones are notorious for their grim military and law enforcement uses. But as the cost of UAV technology has plummeted in recent years, non-government use of DIY drones is on the up and up. Take feral hogs, for example. Too wily for traps, wild pigs breed like rabbits and devastate crops. But there’s a drone for that. James Palmer and Cy Brown’s “Dehogaflier” UAV conducts flyovers of local fields, peering through dense foliage in the dark with a FLIR thermal imaging camera to pinpoint plundering packs of pigs. Advantage hog hunters. 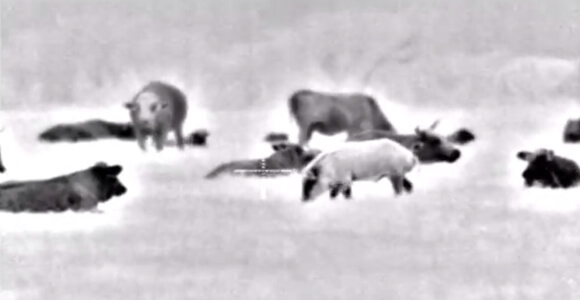 Equipped with location information, Brown picks off the pigs with his rifle and night vision scope. It’s a merciless application of the technology, and Brown told Modern Farmer, it wouldn’t be a “moral or legal” way to kill deer and other game. However, feral hogs are considered “outlaw quadrupeds” in Louisiana, and there are fewer restrictions on how, where, and when they may be hunted. Frustrated local farmers don’t seem to have any ethical qualms. Recently covered in Time and picked up on the web, the two hunters say they have a backlog of interested clients. A vocal contingent of the population argues drones like the “Dehogaflier” present more opportunity than risk. Drones may in the future help keep track of endangered species or deliver packages, pizza, even medicine. Singularity University Labs startup Matternet wants to use a drone network to connect poor rural areas in developing countries where reliable road infrastructure is scarce. What else might drones do? Time and freedom to experiment may tell. But there are plenty of people concerned that allowing private drones to take wing could have major negative consequences. Ostensibly, the “Dehogaflier” is a useful application for UAVs. But how hard would it be to combine the exact same technology to spy on people? Or outfit it with a gun? The FAA is required to set the rules governing UAV use in US airspace by 2015. Whether you build DIY drones for the fun of it or to hunt hogs or can’t help thinking they’re a slippery slope to 1984 by 2020—the drone debate is heating up.